(Nampula, 16th March, 2015) − 10 thousand of peasant families are victims of the most aggressive and imperialist initiative backed by the eight countries with economies regarded as the most developed (G8) in the African continent. Launched in April 2013, the New Alliance for Food Security and Nutrition is leading one of the biggest processes of penetration, usurpation and concentration of land, as well as control of the main strategic and agroecologic regions of Mozambique, holders of more than 70% of natural wealth and subsoil wealth of the country, located in the Development Corridors of Beira, Nacala Corridor and Zambeze Valley, to make them as capital-flow regions and exportation of primary products to the global market. The Academic Action for the Development of Rural Communities (ADECRU), recognized by its important work on democratic engagement and productive insertion of several actors in the construction of a sovereign development agenda, have been monitoring and documenting the entrance process of New alliance in the country in the period from 2013 to 2015, which shows the provoked impacts, the progress strategy of New Alliance over the productive and pluractive system of peasants, the progress strategy of New Alliance over the communities’ land and the rising of protest movements and resistance of communities and peasant families. The geography and map of land grabbing and land conflict in the so called Nacala corridor by ADECRU, shows that the company “Mozambique Agriculture Corporation (Mozaco)”, a integrant of the G8 New Alliance for Food Security and Nutrition in Africa, grabbed 2.380 hectares of land owned by more than 1500 peasants families from Natuto Community, in the Rucha Village, Administrative Post of Canhunha, Malema District, in Nampula Province, to give space the huge soybean production. In the same community Mozaco aims to expand its area of production to 20.000 hectares, which will additionally hit more than 4500 peasant families. To these families, also join other 4 thousands communities in Namipaca, Nioce Locality, Administrative Post of Canhunha, where Mozaco aims to occupy 10 thousands hectares of land for soybean production. If this tentative of expansion initiated in November 2014 goes as planned, then there will be about 10 thousand families affected only in Malema District by Mozaco, summing up a total number of 50 thousand peoples. ADECRU found out that Mozaco is a company established in 2012 through a partnership between the investment society of Holy Spirit Group (Rioforte) and a Mozambican group João Ferreira dos Santos (JFS), making part of the company integrated in the G8 initiative, the New Alliance for Food Security and Nutrition. It’s worth to remind that the Rioforte is a company with head office in Luxemburg that was established in 2009 as vehicle for non-financial assets of Holy Spirit Group, and that, because of the financial scandal of this group, the Rio Forte was placed in the BES’ toxic assets group, to which by the decisions of commercial court of Luxemburg in Ouctober 2014, must be liquidated and the funds used to pay the creditors victim of scheme of fraud from BES. The report from the Unite State of America Development Agency (USAID), entitled Sepeed Report, paradoxically, Mozaco was regarded as a case of success in the progress of New Alliance in Mozambique, covering up intentionally the grabbing of 2.380 hectares addressed to the production of soybean, with concrete actions on going with for its expand to 20.000 hectares. “We have been working in our farm lands since the colonial period, much of them are in the Morgado’s adjacent farm land areas, an old settler who exploited about 1.000 hectares, who later on went to Namele unity, a governmental company. After 30 years come Mozaco to push us off from our land, where are we going? Mozambique is ours and not Portuguese’s one, they cannot push us off from our land as we were goat” said to ADECRU DG, a father of 5 suns, 59 years old, from Natuto. ADECRU’s militant in Nampula found out that during the colonial period part of the area currently in dispute between Mozaco and the Natuto Community owned to the Portuguese colonist mostly known by Morgado, who explored an area above of 1000 hectares of land for cotton and tobacco production. With the national independence acquired in 1975 and because of the nationalizations, the area became to be explored by the Namele Unity, a governmental company which produced also tobacco and cotton. With the intensification of the so called “Civil War” around 1989 the Namele Unity was closed. So, the neighbouring areas to farm lands, whether in the colonial period as well as during the armed conflict were explored by members of Natuto community not only, but since 1989 also begun to occupy in good faith the little of 1000 hectares abandoned by the governmental company, which in the light of the land law n.º 19/97, of 1 October, it offers them the right to use and explore the land (DUAT), in accordance with the recognition of the customary law shaped in the line a) “The right to use and explore the land is acquired through the occupation of individual persons and local communities, according to the customary norms and practice that do not contradict the constitution” and b) “Which in good-faith have been using the land for at least ten years” both from article 12. 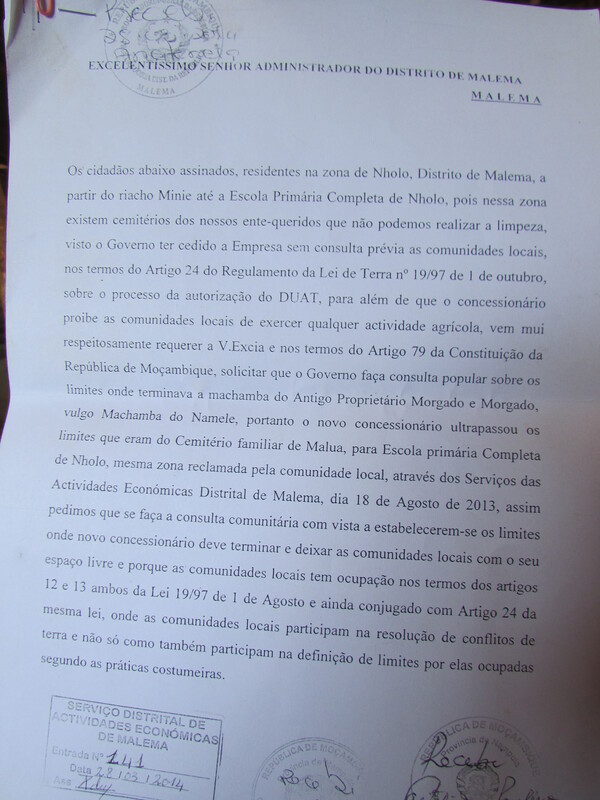 Due to the violation of their rights, in 20th February 2014, families from the Natuto community wrote a letter and address to the Administrator of Malema District, which was also sent in knowledge of the current governor of Nampula province and the Provincial Director of Agriculture of the same province. 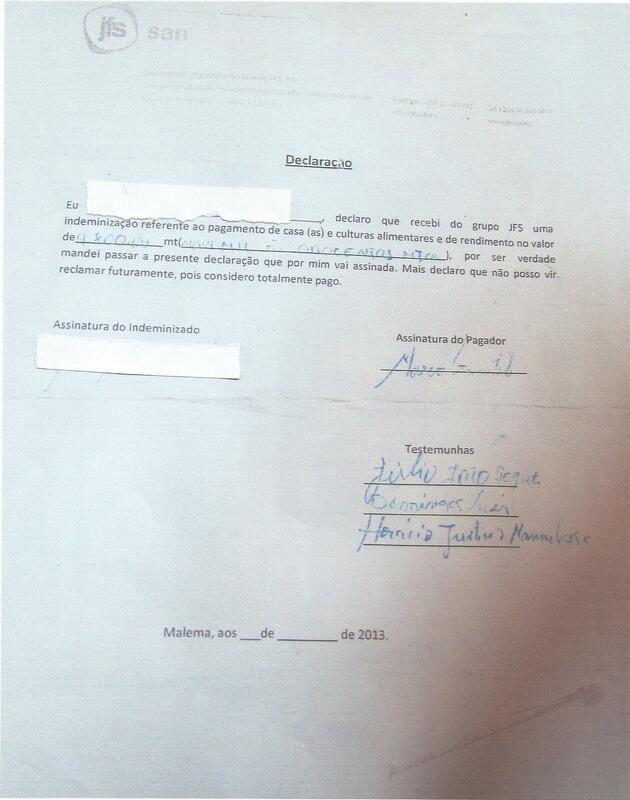 In the document that ADECRU had access the families claim their rights to use and explore the land occupied by Mozaco, including the access to the cemetery area which was also occupied by the company. However, from this latter ADECRU found out that it had never been answered by the government. Letter from the Community of Natuto sent to Malema Administrator with knowledge of the then Governor of Napula and Agriculture Provincial Director. The G8 initiative “New Alliance for Food Security and Nutrition in Africa” results from an agreement signed nearby 40 states and financing institutions and multilateral international organizations in the G8 summit in L’Aquila, Italy, after having been presented for the first time by the USA government under leadership of President Barack Obama, in 2009, actually coming on operations in 2012. With this initiative, the G8 argue that it means to cooperate with the African governments in order to lift out 50 million of African from the poverty, 3.1 million of them in Mozambique between 2012 and 2022. With the mentioned agreement was also launched a supposed World Bank Programme for Food Security estimated in US$ 20 million. Until January 2015, 10 African countries of 20 predicted have already joined to the New Alliance: Mozambique, Benin, Burkina Faso, Ivory Coast, Ethiopia, Ghana, Malawi, Nigiria, Senegal and Tanzania. Due to the launch of the New Alliance in Mozambique on 10th and 11th April 2013, ADECRU published its positioning, available in https://adecru.wordpress.com/2013/04/, against this initiative accusing it of representing “the last and violent structural phase of twenty-first century”. In the same document is also readable that strategy of entering of “New Alliance in Africa is cored in the capture of the Comprehensive Agriculture Development Programme (CAADP), with the objective to give some legitimacy to the G8 actions. In Mozambique this intervention is supported by the argument to align the financial and technical support in the agriculture sectors of the G8 countries members with the priorities of CAADP investment plan of the country, referred as National Investment Plan of Agriculture Sector (PNISA), that respond to the G8 demands and its corporations and not the priorities of the development of the country”. Analyses made by ADECRU reveal that the “New Alliance” on converting into the National Investment Plan of Agriculture Sector (PNISA)it captures and automatically integrate in all the policies of agriculture sector turning it into a central document and operational of agrarian policy. The” New Alliance” forced the government of Mozambique to assume 15 great commitments seeking to reform the agrarian sector, highly dangerous for peasants, that have been leading to three great transformations favourable to the multinationals corporations: (I) transformation of legal framework regarding to the land acquisition, translated to the easiness in conceiving of rights of use and exploration of land (DUAT); (II) reforms on the seed and fertilize national legislation, known SADC laws of seed and fertilizer harmonization, conceiving exclusive rights to the multinationals; and (III) the progress of agribusiness (national and foreign companies) over the communities territories and its respective impacts. ADECRU posses information and evidences that indicate that USAID and the World Bank exert pressure and try to force the government of Mozambique and the extinct Ministry of Agriculture (MINAG) to ease the reform of the legal framework on the existing land so that could be introduced the lease of land and afterwards its privatization with the pretext to enhance the transparency and effectiveness in the administration and management of agrarian policy and lands. Following this pressure and fearing the possible conflicts and social upheavals as consequence of policies that could result from the possible attempts of changing the land law given the sensitivity of land issues, the leaders of the current MINAG were obliged to find a compromise. The solution was an administrative measure, however satisfactorily meet the demands and impositions of the G8 initiative the “New Alliance” at least temporary, for now avoiding other actions of protest and resistance from peasant’s organizations, community and society organizations that have been protesting and denouncing the ProSAVANA. For this purpose, was issued an intern memorandum decreeing the easiness on the attribution of DUAT in the national level in order to reduce the time between 1 to 7 years and from 3 to 12 month, which constitutes a radical change in the normal procedures. In the context of national seed reform it’s known that the government of Mozambique committed to restructure its seed system in order to allow the production and distribution of improved seeds, with particular focus on the hybrid improved seeds, highly dependent of huge scale irrigation and the use of syntactic fertilizer and pesticides. This situation led to the revision of the seeds legislation through the abrogation of the decreed no 41/94, of 20 September, the ministerial Diploma nos 95/91 of 7 August, 6/98, of 11 February, 67/2001, of 2 of May, 171/2001 of 28 November and 184/2001 of 19 December which is the Production Law, Trade and Control of Quality and Certification of Seeds, which the process have been forwarded without consulting civil society organization, farm organizations and communitarian organizations. 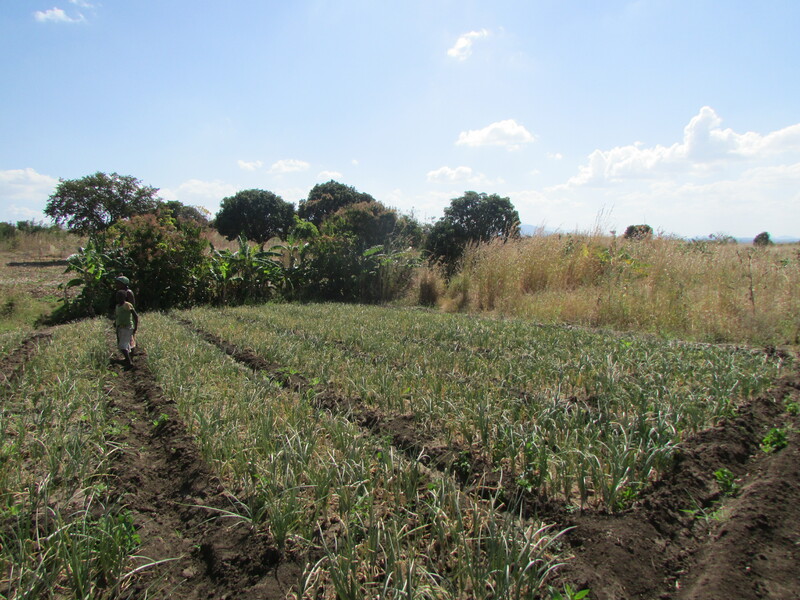 This was uniquely led by the government of Mozambique and USAID, ignoring the peasants systems of seeds production which serve more than 90% of producers, responsible for production of more than 90% of foods, with a contribution of about 25% of Growth Domestic Product (GDP) and employs 81% of population economically active, which 60 of them are women. Moreover, the decree no 12/2013, of 10 of April (seed law) it in body the introduction of substantial changes in favour of the companies in the mechanisms of production, commercialization and utilization of seeds by the commercial sector and peasants farms. The revision of the seed legislation was back up by adoption of board ministers on the Fertilizers Management Law. For ADECRU one of the main and dangerous impacts on the change of this legislation fomented by the New Alliance is the removing of governmental subsidy on the seeds for peasants which consisted in the availability of free seeds and sometimes by the low prices in the years after the agrarian campaign. Linkage to this point, through the article 47, of decree no 12/2013 (seed law), the government of Mozambique authorize the companies to operate in Mozambique the right to import and produce seeds genetically modified (GMO) according to the right stipulated in a specific legislation. In practice way, if the specific legislation of using biotechnology, integrated in the New Alliance, which is being discussed in the Ministry of Science and Technology (MCT) is adopted, Mozambique will became one of the African countries users of GMO’s breaking down the secular system of production and exchange of seeds between peasants, so it will begin a circle of dependence and alienation of peasants by the huge global corporation of agribusiness. Information collected by ADECRU’s researchers reveal that until January 2015, approximately 21 companies integrated in the New Alliance in Mozambique, which 6 of them are national and 15 are foreigners. As a way to facilitate the acquisition of land by these companies was created at the Agriculture Promotion Centre (CEPAGRI) a unity to assist the companies that are integrated in the New Alliance, whose consultants were hired and paid by the USAID. Associated with this unity, a group of companies and international organizations promoter of assistance services to the companies were given finance by the USAID, one of the major recipient was Technoserve which the main goal is to encourage peasants to change their agricultures practices, fomenting the soybean production along the Nacala Corridor, establishing business linkages between these and the companies. In parallel with this process, were designed three programmes of progress by USAID to coopt peasants and impose brutal transformations integrating supposedly the most “coaptants” in the agribusiness chain through the three sob programmes namely AgriFUTURE, Speed programme and FinAgro, the former one is being publically contested by peasants in the Nacala Corridor, including the Nampula Provincial Directorate of Agriculture. It was under this scheme that the Mozaco acquired a DUAT of 2.389 hectares of land in the Community of NAtuto, Rucha Village, Canhunha post Administractive, District of Malema. “As it’s an old governmental farm land, corrupt governmental officers deceived the communities arguing that the communities are occupying a governmental land and the government want to take the land back. Due to the lack of the knowledge of the land law, the community does not see other alternative apart from leaving the farm land which according to the law it belongs to them” denounced one of the ADECRU’s militant in Malema, and further more the militant added that “ we have been seen that this have been the strategy of handing land over to the huge companies in the entire Nacala Corridor, as we have seen the same situation in Nacololo and in Meruto in the District of Monapo, where also old governmental farm lands were given to the a south African company for the production of soy, and the communities still resist the entrance of the company”. 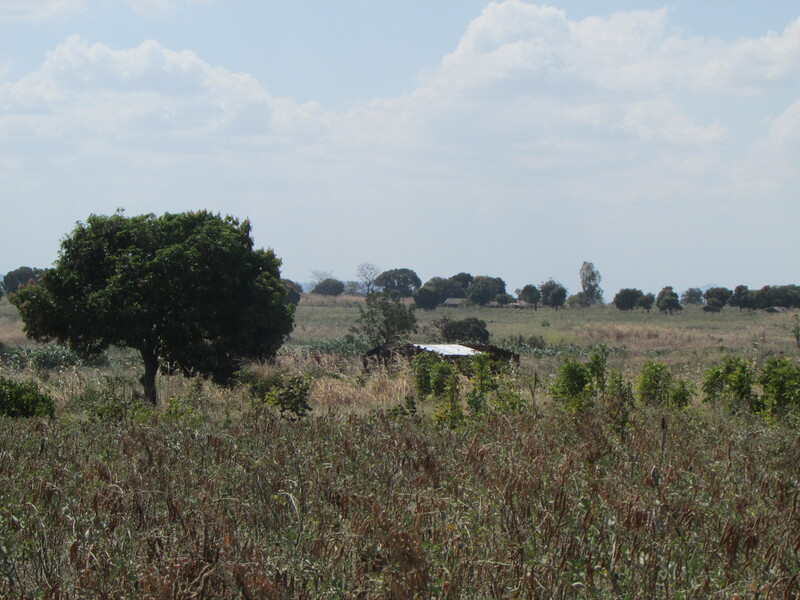 In October 2012 approximately 1500 families who had farm land in the areas where were old governmental farms were pushed off by Mozaco, including 10 families who had residences in the area, and where simply given 3.000 Mt (US$100) to 9.000 Mt (US$200) as compensation for each family. I “used to produce in my farm since 1991” until the time that “technicians from the Malema Distrital Economic Activities (SDAE) told us that we should leave from the governmental estate. And because we didn’t have houses in this areas they also told us that we didn’t have right for anything and consequently we should find farm in the other region” related to ADECRU one of the peasants victim of Mozaco, mother of 6 children. 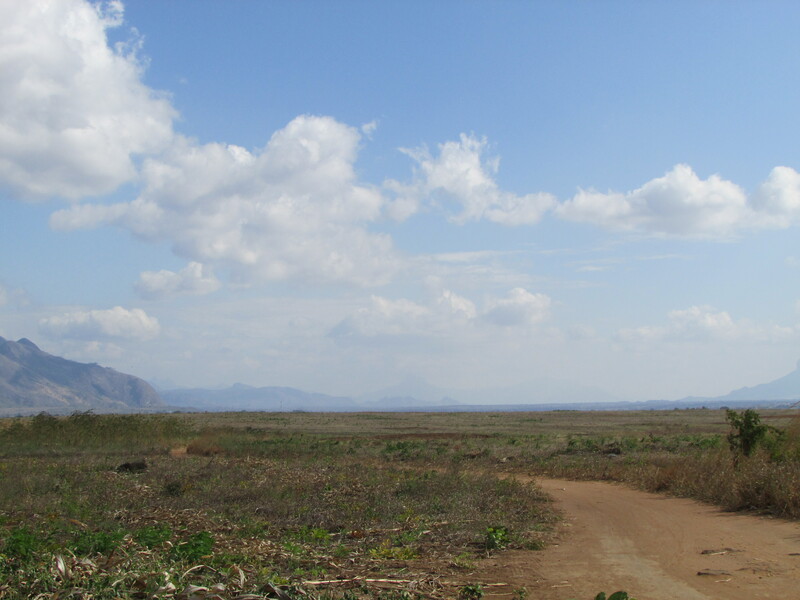 In 2013/2014 agriculture campaign, Mozaco decide to expand its area for soy production towards to a dwelling area of Natuto community, arguing that the company did not yet reached its concession of 2.389 hectares. For this effect, according to ADECRU, on 30th April 2014 the permanent secretariat of the District informed the covered families that the company had the right to occupy the land, and he insisted the idea that the community should leave in order to allow the progress of the project. However, the resident of Natuto Community refused to accommodate the Permanent Secretariat orders in the resistance of to the invasion and occupation of their lands. On 28th June 2014, the president of Malema municipality Counsel, together with the Canhunha Chief of Administractive Post, assembled with the community underlining that all the member of the community should leave the area to go to the other side of the River Nateleia, placing in Nholo (a neighbouring community) “they told us to abandon our houses, farms, cross the Nateleia river and live in the other side so that we may give space to Mozaco. We didn’t accept to abandon our land to give these whites. Said a mother, very much irritated”. 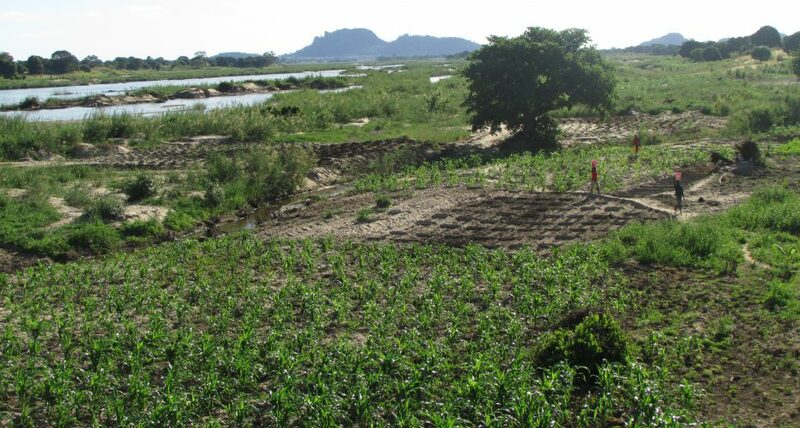 Due to the resistance of approximately 4.000 families from Natuto community, according to the information collected by ADECRU’s militant in the Nacala Corridor, Mozaco and Malema governmental authorities went to Namipaca community, locality of Nioce, Administrative post of Canhunha with the intention to acquire 10.000 additional hectares, in an area dwelled more than 4.000 peasants families that live in there for generation. “The District Permanent secretariat came here in December 2014 and he assembled with us. He said that he came to tell us that the candidate of FRELIMO has won the elections and thanks the community for the votes. Therefore he promised that he would build a school, a hospital and rehabilitate the road that goes up to the community, but all that would be done by a company called Mozaco and that we had to hand over to this company 10.000 hectares. Also he said that we would have jobs in this company, but when we asked where we would live, he said that we had to find lands in the neighbouring regions. When we heard that we refused because we don’t want to lose our land” Said to ADECRU one of the Namipaca leader. Due to the negative answer, the Permanent Secretary of Malema promised the community of Namicapa that he would return with the Administrator of the District to deeply discus about the issue. In the practice the local governmental authorities serve as an instrument of the companies and politic elites from Maputo associated with these businesses, whose role is to deceive communities so that communities can freely give thousands of hectares of land and break down any sort of resistance that could possibly rise. Contacted since November last year 2014, until the closing date of this article, the Mozaco did not answer our requests of interviews formally addressed to this company. As well as the JFS shareholder of Mozaco did not answer same request that was addressed to this company. Dates analyzed by ADECRU reveal that in the context of the New Alliance from G8 for Food Security and Nutrition land business have been conducted with 5 Mozambican companies (Corvus Investments International, ENICA, Mozaco, Lozane Farms e Rei do Agro), until Dismember 2014, in a total area of 33.300 hectares for the production of commodities namely soybean, banana, apple, maize and sunflower. Part of these numbers in the Agrarian campaign of 2013/2014 was effectively cultivated 8.189 hectares by these companies, where the soy represent near to 91% of hectares produced. In the framework of returning and colonial penetration and imperialist of G8 in the African continent after the independence, 10 huge transnational companies under the “New Alliance” accelerate the process of control of value chain through the mechanism of manipulation and alienation of peasant’s families. In this regards, its known that 5 companies among them “Cargill, Competitive African Cotton Initiative – COMPACI, DADTCO, SABMiller,e Sunshine Nut Company they are developing agriculture Project under contract in Mozambique in the context of the New Alliance with focus on production of cotton, soybean, maize, cashew nut. Other 5 companies namely African Cashew Initiative – ACI, AGCO, Swiss Re, United Phosphorus (UPL)/Advanta and Vodafone/Vodacom are involved in the providence of service that goes to the technical assistance to agribusiness, financing, agriculture insurance and commercialization systems. The progress of these companies is backed up by the technical support of the World Bank, USAID, JICA and TechnoServe. In the light of the presented evidences, ADECRU denounce the New Alliance for Food Security and Nutrition over the peasants and communities land and repudiate, with urgency and vehemence, the worsen violation of land law and other applied legislation. The Associative-Political Coordination Counsel of ADECRU invite through this way peasants, environmental and social movements, rural communities, people of good will and all Mozambican people to an urgent action of mobilizing in order to break down the New Alliance aggressive onslaught which in such harmful way has made 50 thousand victims. The Associative-Political Coordination Counsel of ADECRU assumes the commitment to use all the national and international instruments available to hold responsible the companies and the government member of G8 responsible for the New Alliance. ADECRU, also keeps steady and determinate to mobilize and engage all the affected families in a popular movement for protesting, denounce, resistance and struggle in defence of the land, natural resources and its rights in articulation and solidarity with other social, environmental movements, national and international peasants.